The evidence suggests the main factor constraining housing supply in today’s star cities is increasingly burdensome land-use regulation. Critics point to a variety of rules, including minimum lot sizes (as in Boston’s suburbs), urban boundaries (as in Portland), stringent environment rules (especially in California), long building permit times, and caps on the number of permits. Last year the New York Times ran a story on Ms. Sheila James, a 62-year-old woman who commutes two hours and 50 minutes each way between her home in Stockton, California, and her $81,000-a-year government job in San Francisco. The number of Americans like Ms. James with extreme commutes is growing, but their stories represent unusual exceptions that illustrate a larger pattern. More and more Americans are moving to less expensive regions of the country, or, more commonly, settling for the limited opportunities available in struggling communities like Stockton. These changes in the economic geography of American cities have far-reaching implications for upward mobility and economic growth. Underlying the dilemmas many Americans face about where to live and work are two long-term reversals in the economy. First, for much of the 20th century, Americans were more willing to move in pursuit of economic betterment than people in any other advanced country, and the dominant flow of people was from poorer to wealthier locations. The best known migratory patterns were from farms and small towns to regional cities, from Southern agriculture to Northern manufacturing, and from poorer heartland areas to booming cities on the West Coast. This pattern has now reversed. Mobility across state lines has fallen almost by half since the 1980s. In addition, virtually all the highest-income metro areas have experienced net domestic population outflows. Second, the decades between the 1920s and 1980s saw a pronounced tendency towards economic convergence across geographies, as household income levels in lower-income states and cities grew faster than in high-income locations. This trend, too, has reversed, with the richest places growing richer at a faster pace than elsewhere and leaving less fortunate places behind. The emergence of these seismic shifts at the same time seems counter-intuitive at first glance. If the wealthiest cities are pulling ahead in terms of opportunities, why aren’t more people moving to them? For instance, why hasn’t the technology boom from Silicon Valley to Seattle induced more millennials to follow the legendary advice of the journalist Horace Greeley, to “Go West, young man”? A growing number of economists offer a simple answer: most people can’t afford to live where the best opportunities are. Housing prices are just too high. Unless reversed with thoughtful policies, four trends are likely to keep driving the role “place” plays in America’s struggle with economic inequality. Economists have long recognized the benefits an industry gains from geographic concentration. For a new firm, locating alongside existing firms in the same industry brings a deep pool of experienced workers, networks of specialized service providers, and knowledge “spillovers” from nearby competitors. This is why banking has concentrated in New York and film-making in Los Angeles, and why there are hundreds of lesser known industry concentrations across the country, such as musical instrument production in Elkhart, Indiana. Enrico Moretti, a University of California at Berkeley economist, argues that the burgeoning role of “knowledge” industries is increasingly reinforcing these “agglomeration” benefits.Highly- educated graduates have powerful incentives to head for the major “brain hubs,” where up-and-coming employees can learn specialized skills by working with top experts in their fields. And local success begets more success. Star cities enjoy superior schools, higher civic participation, and healthier residents, compared to lower-income cities. The result is widening gaps in the productivity of individual workers across metro areas, and thus growing income disparities as well. Harvard’s Ed Glaeserhas calculated that productivity levels are more than five times higher in leading star metros like the San Jose-Palo Alto area than in relatively poor metros like McAllen, Texas. Productivity is higher in star cities even after controlling for workforce composition, which means that, say, clerical and construction workers earn more by locating in knowledge hubs. Moreover, wages have grown much faster in the leading “high-skill” cities than in other cities since the 1980s, including for lower-skilled people in blue-collar and service jobs. Agglomeration benefits also play out within metro areas. They explain why it makes sense to locate a new corporate back-office campus in the Dallas area’s booming northern suburbs rather than in struggling southern Dallas. They also help to account for the stark polarization between “have” and “have-not” neighborhoods in most U.S. metro areas. Historically, local economic booms led to housing booms. New construction would address the needs of arriving workers, and competition would keep house prices close to the cost of building new homes. Local housing markets have continued to work this way in thriving middle-income Sunbelt cities like Atlanta, Charlotte, and San Antonio. But in today’s high-income “star” metros – above all the Bay Area and New York but also Boston, Seattle, and Southern California – this pattern has broken down. New construction in these cities is running as much as 80 percent below the peak levels reached in the 1960s. This anemic pace of construction is not driven by building costs. In 11 star metros accounting for almost 20 percent of America’s population, house prices have spent the past dozen years comfortably higher than the minimum profitable construction cost for the local market, offering a fat margin that would ordinarily prove attractive to developers. The premise that these places are too dense to allow much construction also turns out to be a myth. Even in metros with densely-populated urban cores, the wider metro areas contain abundant low-density neighborhoods and indeed vacant space. Glaesernotes that the county containing his home in Cambridge, Massachusetts, has lower population density than Houston. Rather, the evidence suggests the main factor constraining housing supply in today’s star cities is increasingly burdensome land-use regulation. Critics point to a variety of rules, including minimum lot sizes (as in Boston’s suburbs), urban boundaries (as in Portland), stringent environment rules (especially in California), long building permit times, and caps on the number of permits. Cities also impose seemingly well-intended policies with predictable side effects. California, for instance, is considering repealing its law limiting rent control, which would drive up rents on ever-scarcer non-controlled units and present enormous disincentives for new construction. Several studies confirm that land-use ruleshave grown considerably stricter in the big coastal metros since the 1980s, and that the cities imposing the toughest regulations have experienced slower growth in supply and far more severe price appreciation than other U.S. cities. The effect on housing prices has been especially pronounced for working-class housing, as regulatory constraints tend to bite harder in this segment than in more affluent neighborhoods. Prices have increased faster in middle-class Williamsburg in Brooklyn than on the Upper West Side since 2011, and more in Stockton’s San Joaquin Valley than in California as a whole. Prices have now reached extraordinary levels. According to the data firm Demographia, median house prices in the top star cities are some 9 to 10 times median household income, or three times what is typically viewed as financially sustainable for a family. Even though wages for lower-skilled people have grown faster in the star metros than elsewhere, net returns after housing costs have generally deterioratedfor these workers since early in the last decade. This helps explain why the net flow of lower-skilled people has been out of these cities, and why fewer people are moving to pursue economic opportunities at all. Once again, the same dynamic is at work within metro areas. In geographically dispersed places like Houston and Dallas, neighborhoods with attainable housing for lower-skilled people are increasingly separated from good career opportunities by vast distances. Only an intrepid few sign up for extreme commutes like Ms. James’s. When the number of people who settle for living in low-opportunity locations is sufficiently large, poor matching of workers’ talents with available opportunities holds back growth for the whole economy. And there’s an additional effect: each high-skill job at companies like Apple requires as many as five middle- to low-skill jobs. If there aren’t enough of these people available, companies don’t create as many high-skill jobs as they otherwise would, imposing further constraints on growth. Moretti and his collaborator Chang-Tai Hsiehestimate that, if the New York and San Francisco Bay metro areas loosened their land-use restrictions to the average level of other cities, the tremendous influx of people and resulting increase in average productivity levels would lead to a 9 percent increase in the U.S. economy. Another studyfinds that a change by all states to the relatively loose rules of Texas would raise California’s population by 6 million, and the U.S. economy by almost 12 percent. Urban revitalization policies centered on attracting businesses to areas with concentrations of lower-skilled people should have a place in America’s growth strategy. But the forces favoring agglomeration are powerful, especially in knowledge-based industries. Today’s star cities and neighborhoods will likely keep outpacing the rest of the country in productivity growth and wages. A technological revolution in housing to reduce construction costs in dense areas. Helpfully, Google, Amazon, and various startups are starting to experiment in this area. The thorniest challenge in addressing this issue is that local governments in star cities have little incentive to look after the interests of people who would benefit from moving there but can’t afford to do so. Moreover, they have little incentive to pursue policies that would maximize economic growth and opportunity but would impose unwanted changes on current residents. This challenge raises a larger point. It’s common to think about how “the economy” affects particular geographic locations. But “the economy” is an add-up of many local economies. It’s time to focus attention on how local policies influence the national economy, as the essays in this issue of The Catalyst aim to do. 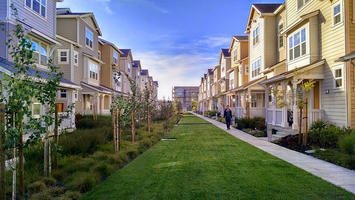 This entry was posted in Affordable Housing, Smart Growth. Bookmark the permalink.